A large number of protective mAbs to CHIKV glycoprotein have been isolated from immunized mice. However, a small number of human mAbs (13 neutralizing) from convalescent patients have been isolated using human hybridoma technology. 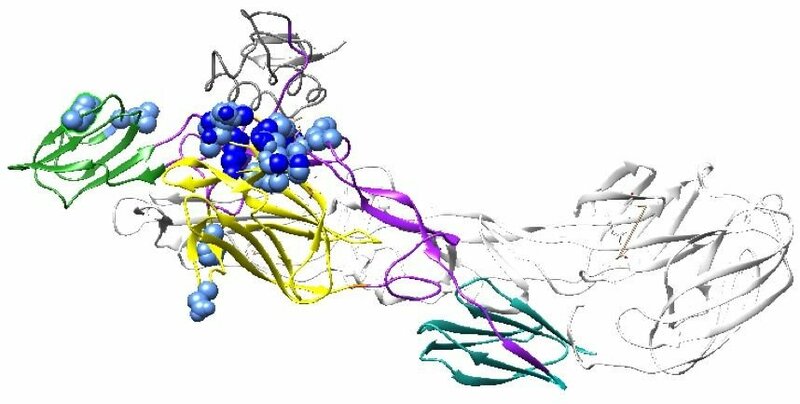 Notably, previously isolated CHIKV human mAbs predominantly mapped out to narrow epitope. Recent advances in human mAb isolation have demonstrated substantial increases in the ability to isolate mAbs against infectious diseases that have lead to the discovery of novel epitopes. Using high-throughput single B-cell sorting technology our lab aims to profile in detail the human B cell response of CHIKV convalescent patients. Figure 1: Proposed human mAb isolation from a convalescent patient. 1.Blood drawn will undergo B-cell enrichment for single B- cell sorting. 2.Fluorescently activated cell sorting for B-cells positive for p62-E1 antigen. 3.Single B-cell RNA will be rescued and cloned. 4 Intact human antibodies purification recovery. Figure 2: P62-E1. The E1 segment is shown in white and the E2 segment is color coated as follows: Domain B-green, Domain A-yellow, Beta-ribbon linker-purple, Domain C- forest green. E3 is shown in grey. Blue spheres represents escape mutant residue; dark blue represents potent neutralizing mAb and light blue represents weakly neutralizing mAb. 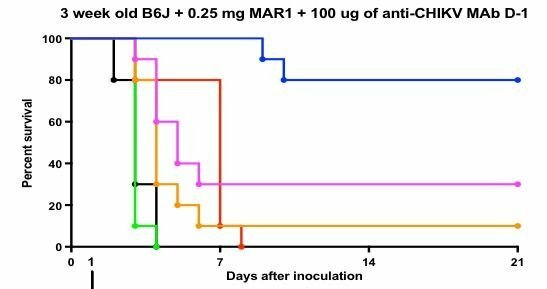 Figure 3: CHIKV mAbs (100 μg in PBS, 6 mg/kg) were administered to 3-week-old male C57BL/6 mice treated with 0.25 mg of an anti-Ifnar1 blocking mouse Mab intraperiontally 1 day prior to CHIKV-LR inoculation. Mice were inoculated subcutaneously in the footpad with 1000 ffu of CHIKV-LR diluted in PBS and survival followed for 21 days after inoculation. DC2.271B afforded protection against CHIKV-LR for 21 day challenge.